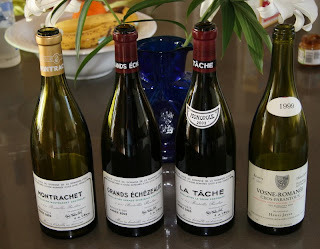 Our colleague at Elixir celebrated a birthday in style by opening the following wines (left), which includes DRC Montrachet, Grands Echezeaux, & La Tache 2003 plus Henri Jayer Cros Parantoux 1999. Not a shabby lineup and the word 'jealous' comes to mind! While I still have not heard feedback on all the notes and descriptions, I understand it was epic to say the least. What I appreciate most about seeing and hearing such descriptions is that drinking such rare and sought after wines sometimes takes a backseat to just owning them. I do have a small wine collection myself, and I need to start opening more and hoarding less. I personally love to contemplate special occasions, who will be there, what will be the food served, what would be the perfect wines for the moment? At some point you just need to bite the bullet and say 'today is the day.' I don't want to be 80 with an incredible wine collection but not enough memories of enjoying those bottles. "A predictable amber rust color and earthy bouquet. Very surprising explosion of fruit at the entry - clearly the wine is aging VERY well. A backdrop of currents and blackberries at the entry and an aftertaste of dried fruit. Perhaps the most stunning experience of the wine was how smooth it was. Over and over again I described to my lucky friends a taste that was almost creamy (not syrupy but so balanced on the palate that I had to keep reminding myself this was a 23 year old wine). The softness, the creaminess gave a faint reminder of banana or perhaps kiwi. But even with the marvelous fruit, it still maintained a solid structure - I would even say it was sprightly. Although the tannins were domesticated there was still enough remaining to soften for several more years. I might suggest the balance of the tannin will be depleted in 5 -10 years. The acid that gave it the sprightliness I would put at about 30% of original whereas the tannins were at about 15-20%. We tasted the wine with three different types of Pate de Fois Gras and the combination was heavenly - the velvety texture of the fois gras softened what remained of the tannins and released a taste so marvelous you were compelled to close your eyes to appreciate. We saved a little for the roasted leg of lamb but the subtlety of the Burgundy did not do anything special with the meat - although that is my personal bias with most red meats. We finished the bottle with one of the most famous cakes in Sacramento, the Chocolate Fudge cake from Freeport Bakery and there the wine and chocolate harmonized in the same way as did the foies gras except, of course, sweeter. I have no regrets whatsoever - it was a fantastic bottle and we celebrated a fantastic occasion and the memory will linger as long as I have a few brain cells remaining." No regrets indeed, what an experience and one he will soon not forget. Sharing that with someone you love can make it even better. Of course it could have been corked, what a tragedy that would have been, but you never know unless you try. I guess there's some truth in that statement. Here's to owning, and drinking, great wines like DRC -- Cheers!